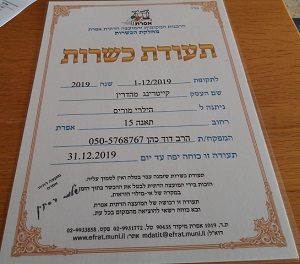 We have just celebrated our youngest daughter’s Bat Mitzva. Being the youngest, we did things differently this time! Sivan had two parties – one at home for the family (fifty in all) and one in our shul hall for her friends (another fifty plus). Both events were catered by Hilary Morris of Efrat. One was a flesihik meal, the other a milchik one. 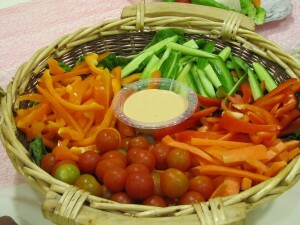 At both events the food was delicious, plentiful and tastefully presented. The waiters and waitresses were helpful and pleasant, and Hilary herself was always on hand to see that things were running smoothly, checking up with us regarding schedules of courses etc. Even set-up and clear-up were handled exclusively by them. Even her prices were very fair! I cannot recommend her highly enough. We used Hilary Morris for a party of over 100 people and I want to recommend her to everyone in Listland and say that she is great to work with! And the teens she brought to work with her were all helpful, hard-working, and courteous as well. The room was set up beautifully (and quickly!) and everything was as we had discussed. The food was plentiful and good home-style cooking. Very reasonably priced and Hilary was helpful on every detail. Thank you Hilary! I have used Hilary twice for smachot and we had great experiences both times. Her prices are by far the best we could find in the area, and the food was quite good, particularly the desserts. Hilary and her staff were a pleasure to deal with. Highly recommended. Hi I just want to give a big shout out to Hilary Morris for catering my daughter’s bat mitzvah. This is my third simcha using Hilary and each time the service was amazing. She is so easy to work with her food is great and her prices are reasonable. She also makes the most yummiest desserts!!!! I love having the feeling that i can just show up and enjoy my simcha and not worry about how the food will look and taste…..thanks Hilary!! Thank you again for the amazing job you and your team did Sunday night. We were completely satisfied and are very grateful for your hard work and flexibility. We would be delighted to provide references is the future and I will post something on the Yahoo group as well.